Westin Dublin, Dublin discount hotels and accommodation. Behind the historic-listed facade of the former Allied Irish Bank built in 1863, The Westin Dublin is the new landmark in Ireland's capital, occupying a city block opposite Trinity College. Discover Irish charm and elegance in all of our guest rooms. Eight flexible meeting rooms feature natural daylight and offer the latest audio-visual equipment. The original 19th-century Banking Hall, timelessly restored, seats over 200 people. Our superb location puts the exclusive shops of Grafton Street and Dublin's business district within walking distance. View photos, room descriptions and make online reservations at Westin Dublin. 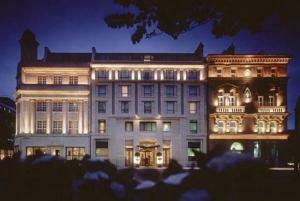 Save on room prices at Westin Dublin, Dublin.